January 2012 Visa Bulletin is now out! - Gateway to Canada | Canada Immigration Consultancy! January 2012 Visa Bulletin is now out! 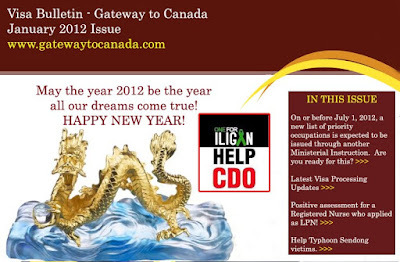 Visa Bulletin is a monthly newsletter for Gateway to Canada clients. If you are planning to immigrate to Canada or with a pending application, you may learn a thing or two from it.